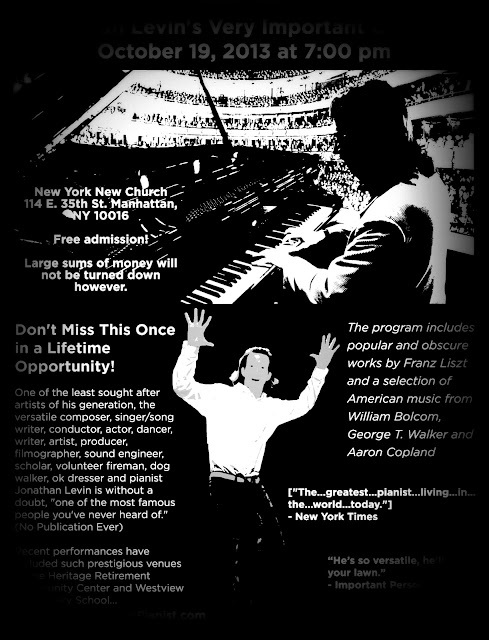 “He is so versatile, he will mow your lawn,” hails this hilarious concert announcement, created by the very talented pianist Jonathan Levin, whom I just had to meet after seeing this. Regrettably, I could not make it to his “very important concert,” but I checked out his playing via internet and definitely think this Manhattan School of Music alumnus warrants more attention than he claims to get! Even though he has so far escaped discovery by record labels and management, he has – beyond a fine pianism – something quite viable to offer: humility and a self-effacing humor that keeps him down to earth, sporting an utmost unaffected air while steadfastly pursuing his dreams: And that is playing the piano, composing, teaching… and approaching its third season, he produces a piano festival in his hometown Clayton, in North Carolina. To help his festival gain momentum he just finished a documentary which describes Jonathan’s vision and the festival’s goal: to make classical music approachable and accessible to all audiences. Each of the performances of the two week long piano fest have specific themes and incorporate a narrative by the performers, giving insight about the composer’s life and his work. They also share their own feelings about performing these works, engaging the audience and enhancing the entire experience.